This diagram shows the individual cells inside a green coffee bean. These cells expand during the roasting process but most of them remain intact, protecting the coffee flavor. 1. Respect the bean. To really appreciate good coffee, approach it with a respectful attitude. 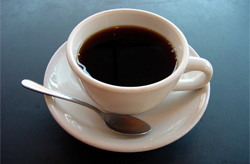 Only a small fraction of total worldwide coffee production is good enough to create premium brewed coffee. 2. Respect the coffee farmer. Confirm that your coffee is grown in a sustainable way, both in terms of soil health and the health of the people who work on the coffee farm. Confirm also that the farmer is receiving a fair price or wage for growing and harvesting the coffee. 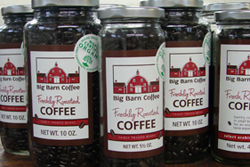 We are Certified Organic as a coffee roaster by MOFGA and we roast only Fair Trade Organic coffee. Each lot of coffee that we roast is traceable to its Organic certification at origin. 3. Use freshly roasted coffee. Coffee flavor peaks 3-7 days after roasting and then declines, no matter what packaging method is used. 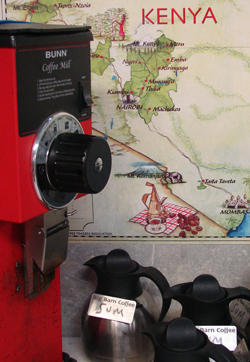 If the roasting date is not declared on the label, find out when your coffee was roasted in order to confirm that you are using freshly roasted coffee. 4. Store roasted coffee beans at room temperature in an airtight container away from sunlight. Moisture and oxygen accelerate the staling of roasted coffee. Repack your bulk purchase of roasted coffee beans into clean, dry glass jars, with each jar holding the coffee required for one day – that way you minimize the exposure of the coffee to humidity and oxygen. 5. Measure coffee amounts by weight, not volume. The density of roasted coffee beans varies greatly by coffee type and by roast style – this means that volume measures are not consistent. An inexpensive digital gram scale is enough to assure accurate weights. 6. Use a grinder that creates uniform particles. This is done to insure that the brewed coffee is neither over extracted, resulting in coffee flavor that is too strong, nor under extracted, resulting in weak coffee flavor. Uniform grinding is much easier with a burr grinder than with a rotating blade grinder. 7. Use freshly ground coffee. Each roasted coffee bean contains hundreds of thousands of individual cells that hold and protect coffee flavor. Grinding the coffee bean breaks up these cells and exposes the coffee flavor to the air, resulting in loss of flavor. Use the ground coffee within minutes of grinding. 8. Use good quality water. Start with cold water and heat it to boiling before using it in order to drive off dissolved chlorine and oxygen. Ideally, water for coffee should contain 80-85 ppm. of hardness in the form of Calcium and Magnesium. Natural spring water usually contains more minerals than local tap water. 9. Serve coffee immediately after brewing. Hold brewed coffee in an insulated carafe for no longer than thirty minutes. Never reheat cooled coffee. 10. Take time to savor the brewed coffee. Premium brewed coffee changes as it cools, revealing subtle and unique flavor notes.